Last week in Part 1 of this series we took a look at dry hopping beer, and how dry hopping can enhance the flavor and aroma of your home brewed beer. We also discussed why pellet hops work best, and how shorter contact times and higher temperatures can help in dry hopping. This week I take a look at when to add dry hops. Surprisingly there is a lot of variation here both in theory and practice. 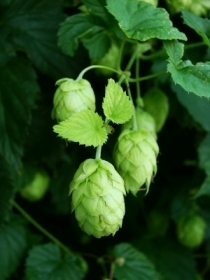 Traditionally, dry hops were added to the secondary shortly before bottling, and in the case of some English ales, often left in the keg (keg hopping), in the theory that the hop aroma would be preserved best by quickly bottling the aroma up before it could escape. Hop oils are indeed volatile, and can boil off at temperatures well below boiling. However, none of the major aroma oils have a boiling point anywhere near fermentation or room temperature, so you typically will not lose these oils if you don’t bottle immediately after dry hopping. Hop compounds in general do decay with time, heat and from light, however, so you don’t want to dry hop and leave your beer sitting around too long. So in many ways, the average home brewer can’t really go wrong adding hops 2-3 days before bottling. The only disadvantage is that some hop material may remain suspended in the beer until it later falls out and add to the sediment in the bottles. Many commercial brewers will add their dry hops shortly after primary fermentation is complete, and leave the hops in their beer for a few days at fermentation temperature before cold crashing the beer. The advantage of this method is that you do get good hop oil transfer, and cold crashing the beer will allow any excess hop material to fall out of the beer. Finally, some brewers have experimented with adding dry hops during active fermentation. One school of thought says this is inefficient as the CO2 bubbles during active fermentation will “scrub” the aroma from the hops and be lost. However, this is too simplistic a view, since hop aroma comes from the hop aroma oils suspended in the beer and is not merely some “gas” to be scrubbed out by CO2. What does happen during active fermentation is that you often get a slightly different flavor profile than dry hopping at a later time. The precise mechanism is not well understood, but it is clear that the chemical processes during active fermentation interacts with the hop profile and produces an entirely different overall effect. Commercial and home brewers have just started to play with this method, but it is an interesting option for those willing to experiment. So the three options for dry hopping include: dry hopping right after fermentation, dry hopping shortly before bottling and dry hopping during active fermentation. A home brewer really can’t go wrong with either of the first two options. More adventurous brewers might experiment with dry hops during active fermentation – which can produce some interesting results. Do you have thoughts on dry hopping? Leave a commend below. Per 5 gal containers what volume of hops, weight is good, do you see as “proper”? Can you give us some guesses that commercial beers use? 2 oz per 5 gal or is it 6 oz ? This is great! I am planning on dry hopping for the first time on a Black IPA that I have fermenting right now and I couldn’t decide on when to add the hops. This gives me a good idea of the time frame I should be looking at. Thanks for putting this together! I have just brewed a successful second batch of my Black IPA that is WONDERFUL. I dry hopped it for 7 days with 3 ounces of pelletized hops: 2 ounces of Citra and an ounce of Falconers. I know dry hopping is supposed to be easy, but I struggle with this one. Is it any different for homegrown hops perhaps? Your recipe looks very tempting! I finally bottled my black IPA this weekend after 6 days of dry hopping and my initial taste test impressions were very good. I bookmarked your recipe so that I can try that one out later! I think it was Steve Dressler from Sierra Nevada who suggests adding hops with gravity 0.004-0.006 above predicted terminal gravity. The logic is that any oxygen introduced with dry-hopping (esp. with whole flowers like Sierra Nevada uses) will be consumed by the active yeast as it finishes the fermentation. There’s probably not too much aromatic loss at this point, since fermentation is fairly slow. When I read in a recipe “dry hop for 10 days”, does that mean I should insert the dry hops 10 days before bottling, or that I should transfer the beer into a new carboy 10 days after inserting the hops, or does it mean something else entirely? Bill, I read it as adding the hops 10 days prior to bottling. I know that thread has been around for a while, but here goes. What about using debittered hops for dry hopping? Since dry hopping isn’t about bitterness it seems to be a good choice to me. @Webgary, no point in using debittered hops as the bitter resins won’t get extracted at normal dry-hopping temperatures. However I would encourage experimentation with your choice of variety. Once a fellow commercial brewer offered a taste of a deliciously fresh, floral cask ale dry-hopped with … Target! I was surprised to say the least. So as I say, don’t look at the alpha content & do experiment. My own thoughts are that dry hopping after primary fermentation avoids any of that theoretical interference from active CO2 bubbling and yeast. But also – and more importantly – in secondary fermentation the SG/ABV is approaching the final level and so alcohol plays a part in dissolving out the hop aroma essential oils. If I’m adding whole leaf hops for dry hopping, should I do anything to the hops to prevent any sort of unwanted bugs or wild yeast strain that moght be on the hops from tainting my finished beer? @Bill Newbold if you’re adding them after primary the alcohol content of your beer should be enough to kill off any nasties. I’ve always dry hopped all of my beers and have never had any issues. I’m interested that there’s no suggestions for amounts or ratios.